Does LotoRainbow Really Work? Read 7 Reviews! LotoRainbow operates behind the belief that when you are comparing an expected behavior with an actual result, you will be able to use logic when choosing your winning numbers. LotoRainbow Exposed — Revolutionary Method or Another Scam? Just when you though playing the lottery was pretty cut and dry, there is a new way being introduced to the public that claims to help improve your odds. The latest method introduces the idea that winning numbers have particular behavior patterns. LotoRainbow has combined math and colors to give you a better understanding of how the lottery numbers “behave” and this method is intended to give you a clear visualization of the lotto results. LotoRainbow operates behind the belief that when you are comparing an expected behavior with an actual result, you will be able to use logic when choosing your winning numbers. In order to do this, you will need to study a group of templates (more on that later) that have the biggest difference when it comes to possible results. There are two particular strategies that you can choose from when employing this method, advanced and delayed. The advanced method allows you to bet on a group of numbers that are selected more frequently than others. The site uses the phrase “in fashion” when talking about these numbers because they consistently are being selected more than others. The delayed method has you selecting numbers from groups that are not chosen as frequently and you believe the numbers reduce their lateness and will eventually be chosen. Once you’ve chosen your method, you will have to look at the templates that coincide with the particular game and method you’ve selected. If you go to the LotoRainbow site and familiarize yourself with the charts, this is what you will see. This chart is pretty self-explanatory. Every game uses this number system in their charts. The game template is where the fun begins. With this chart, it shows you the color distribution for a particular game. The organization of the template makes it easier for you to understand the possibilities of a certain lottery game and you can choose your numbers accordingly. 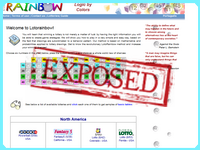 LotoRainbow claims that these templates are backed by real facts from lotteries all over the world. Now the legitimacy of this claim is rather up in the air because there doesn’t seem to be current proof on the site of these templates. This particular chart is for the Super Sena game. It shows you the probability of a template being used in every 100 drawings and the calculations can be confirmed by the drawings map for that game. The site also goes one step further to simplify the number selection process by splitting the colored templates into two separate groups. 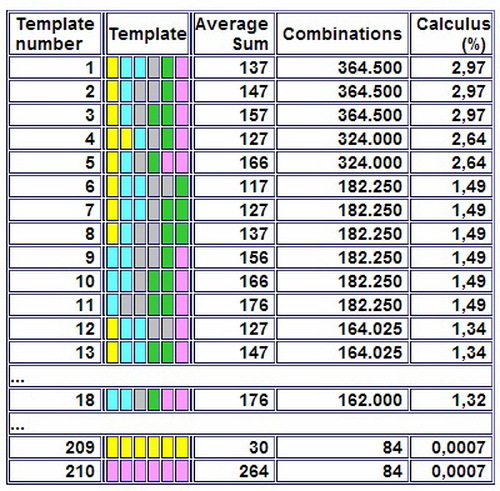 • Types of classify templates by the number of times colors repeat. • Starts are classified by the color at the beginning of a template and the probability of how many times it will show up. The site believes that these groupings will let you quickly identify which “template region” has the largest difference between the drawings and the intended results. Now I don’t consider myself a dummy by any stretch of the means, but this LotoRainbow method seems incredibly involved and confusing to me. Colors and numbers, probabilities and different methods. It’s just… Maybe I’m over thinking things? The thing to keep in mind is, your chances of winning the lottery are around 1 in 300 million. If you choose numbers that are from a more likely combination, you raise your chances of winning, but even if it increases your odds by 10 or 100, your odds of winning are now only 1 in 30 million, or 1 in 3 million. This is just fun to use. Do not select “rainbow” template lottery numbers expecting that you will win something. My belief, not fact is simple. The understanding of the frequency of events can make selection better. Choosing all consecutive number would not make sense. Understanding and eliminating irrelevance can improve odds. I won a hundred dollars a couple times. And the biggest drawing in the jackpot history for over a billion dollars I missed every single drawn number by one number. That hurt. I used the rainbow system. I gotta give this guy or gal credit on creativity. The use of the colors is fun. At the same time, forget it on practicality of use. This is so convoluted and if I read through it all correctly, simply is identifying the frequency of numbers. Lottery is random. If I’m wrong, someone correct me! Surely it doesn’t work. It calculates the probability of a color pattern, but you don’t bet on a color pattern, you bet on a single combination, and all combinations are equally probable.